Historically the strategic and geographical focus has been predominately exploration in Louisiana, USA. This focus had shifted in 2014 to include oil reserve acquisition in the MENA region. In Yemen, the Company holds two leases. One with undeveloped oil resources, and substantial exploration potential, and the second a production licence over five sizeable oil and gas discoveries, one of which is developed (An Nagyah) and was in production until late in February 2014. The Company will actively continue to identify and acquire additional developed and undeveloped reserves within the MENA region. Block 7 is an onshore exploration permit covering an area of 5,000 square kilometres (1,235,527 acres) located approximately 340 kilometres East of Sana’a, 80 kilometres North East of the Company’s Damis (Block S-1) licence, and 14 kilometres West of OMV’s Habban Oilfield. The block contains the Al Meashar oil discovery as well as an inventory of eight potential prospect/lead targets ranging in size from 2 to 900 MMbbl oil gross, defined by 2D and 3D seismic surveys. The Al Meashar Oilfield (target resource of 11 MMbbl to > 50 MMbbl) contains two suspended discovery wells which in 2010-11, delivered flow rates ranging from 200 to 1,000 bopd in short-term testing of the wells. The oil exists in the same reservoirs and has a similar quality of oil to that of the Habban Oilfield. Petsec currently holds a government approved non-operating 75% working interest (63.75% participating interest) in the Block 7 Joint Venture and expects to acquire from KUFPEC its 25% working interest in Block 7. The KUFPEC transaction brings the Company’s potential interest in the block to 100% pending customary approvals from the Ministry of Oil and Minerals. Operator: Yemen (Block S-1), Inc.
Damis (Block S-1) is located approximately 80 kilometres to the southwest of Block 7 and holds five sizeable oil and gas discoveries – the developed and productive An Nagyah Oilfield, and a further four undeveloped oil and gas fields – Osaylan, An Naeem, Wadi Bayhan, and Harmel. The four undeveloped fields hold substantial oil and gas resources in excess of 34 MMbbl of oil and 550 Bcf of gas 1 representing substantial potential future growth of reserves and production for the Company. 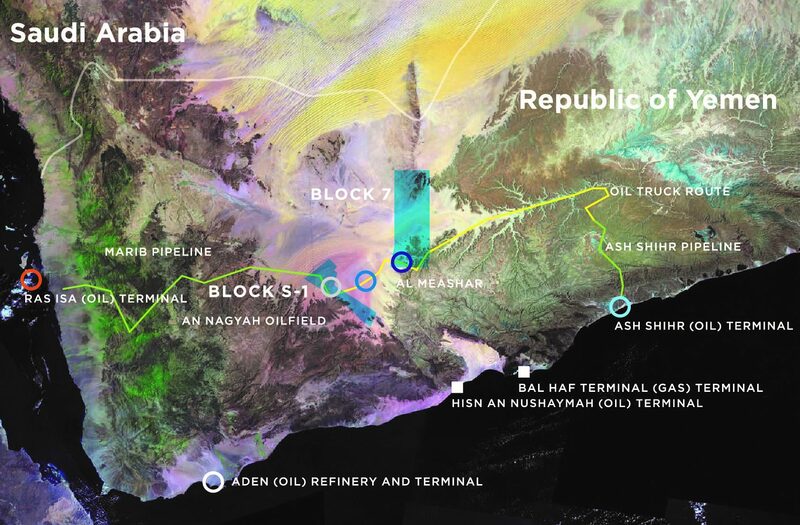 The block contains significant existing infrastructure, including the An Nagyah Oilfield facilities which were shut-in at the end of February 2014 following the declaration of Force Majeure by the previous operator due to the political situation in Yemen and the resulting inability to ship An Nagyah oil from the export pipeline terminus on the West coast of Yemen. The field was brought into production in 2004 with recoverable oil of 50 MMbbl of which about 50% remains to be recovered, and produced at a peak rate of 12,000 bopd. The An Nagyah production facilities have been well maintained during the shut-in period and remain in good condition. While the crude oil export terminal at Ras Isa remains closed, the Company has pursued other oil transport options. 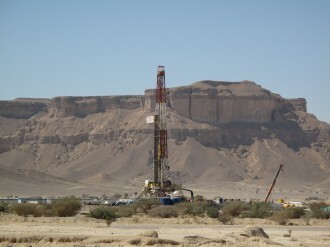 These include oil production to be trucked 530 km East to the Masila Basin Pipeline Hub, and thence by pipeline South to the export oil terminus of Ash Shihr near Mukalla, or oil trucked 70 km East to the head of the Block 4 pipeline which runs 204 km South to storage and export shipping facilities at Bir Ali, or trucking oil 300 km South West to the refinery at Aden. The internationally recognised Yemen Government led by President Hadi has requested that oil producers in Southern Yemen restart production as soon as possible, using the Yemen Government’s facilities in the Shabwah and Masila areas until such times as the Marib Pipeline is permitted to be operational. The Company has been seeking the necessary government approvals to access the above mentioned government oil export facilities, since early 2017. At such time as the government delivers the necessary approvals to support Marib/Shabwah oil production and delivery to Yemen Government owned facilities, the operations to restart oil production at the An Nagyah Oilfield can commence. The Company is planning to commence production at 5,000 bopd and within 12 months increase production to 10,000 bopd, from currently suspended wells. 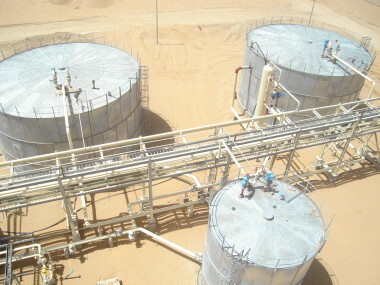 Based on a production rate of 5,000 bopd only, in the remaining period of the production licence, using the costs associated with trucking 530 km to the Masila Basin pipeline, the independent audited reserves were assessed to be 12.8 MMbbl (2P) gross of which the financial net to Petsec Energy is 5.6 MMbbl of oil, having an NPV10 value of US$155 million at the forward prices of 1 January 2016.